This model has been checked and it runs in both COR and PCEnv to recreate the published results. Units are consistent throughout. In this particular version of the model, time is expressed in milliseconds and all calcium variables and parameters have been normalized to the total concentration of TnC (parameter A_tot). Abstract: We have previously proposed and validated a mathematical model of myocardium contraction-relaxation cycle based on current knowledge of regulatory role of Ca2+ and cross-bridge kinetics in cardiac cell. That model did not include viscous elements. Here we propose a modification of the model, in which two viscous elements are added, one in parallel to the contractile element, and one more in parallel to the series elastic element. The modified model allowed us to simulate and explain some subtle experimental data on relaxation velocity in isotonic twitches and on a mismatch between the time course of sarcomere shortening/lengthening and the time course of active force generation in isometric twitches. Model results were compared with experimental data obtained from 28 rat LV papillary muscles contracting and relaxing against various loads. Additional model analysis suggested contribution of viscosity to main inotropic and lusitropic characteristics of myocardium performance. 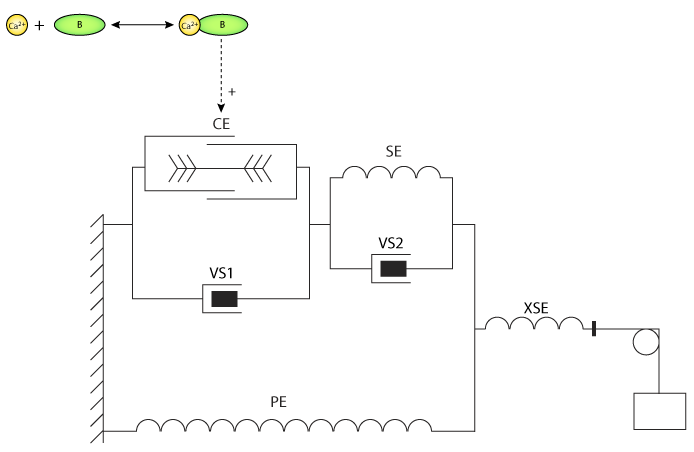 Schematic diagram of the Katsnelson et al model - an updated rheological scheme of the heart muscle including contractile element CE, two passive elastic elements PE (parallel one) and SE (series one) and two viscous elements VS1 and VS2. The effect of calcium and the calcium binding ligand (B) in facilitating actin-myosin binding is also highlighted. Derived from workspace Katsnelson, Nikitina, Chemla, Solovyova, Coirault, Lecarpentier, Markhasin, 2004 at changeset ff37a293c456. Time is expressed in milliseconds, calcium variables and parameters are normalised to total TnC concentration. Time is expressed in seconds, calcium variables and parameters are expressed in absolute values. Time is expressed in seconds, calcium variables and parameters are normalised to total TnC concentration.